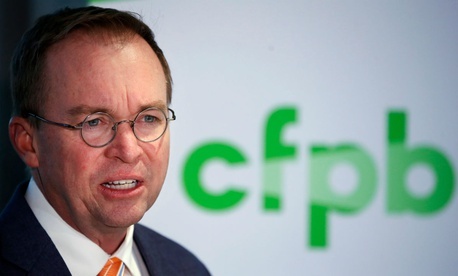 Just days after postponing another scheduled meeting of its statutorily required Consumer Advisory Board, the acting head of the Consumer Financial Protection Bureau on Wednesday told staff that all 25 volunteer members of the outside body were being relieved of their duties. The advisory board, set up under the 2010 Dodd-Frank Financial Reform Act that created the controversial CFPB, is made up of consumer issue experts from industry, academia and the nonprofit community from various regions. Under the Obama administration, the board met regularly to help the bureau formulate policy on issues ranging from mortgage abuse to student loan fraud to risky payday lending. Combined with the membership of the two councils, the Wednesday announcement means some 60 members are being rotated out. The advisory board’s recasting—critics would say disempowerment—under the new plan was precisely what consumer advocates upset by Mulvaney’s dramatic policy changes had feared. Additional reasons for reconstituting the board were published by the National Consumer Law Center, which described comments by phone to board members from CFPB political appointee Anthony Welcher. “The bureau wanted to save a few hundred thousand dollars,” the center reported him saying, gauging that to be less than .08 percent of the agency’s overall budget. The email cited comments from a request for information on external engagement as a factor in Mulvaney’s decision, though no specific comments favoring dissolving the board were quoted and the comment period was still open when the decision was made, the center pointed out. “Members questioned how Acting Director Mulvaney could have come to this conclusion based on the fact that there had been no meaningful interaction with members,” the center’s summary said. And critics challenged the idea of substituting town halls and roundtable discussions, noting that such tools have long been in place at the CFPB. Members and consumer advocacy groups expressed dismay. “Firing the current CAB members is another move indicating Acting Director Mick Mulvaney is only interested in obtaining views from his inner circle, and has no interest in hearing the perspectives of those who work with struggling American families,” said Consumer Advisory Board Chair Ann Baddour. “Apparently Acting Director Mulvaney is willing to listen to industry lobbyists who make campaign contributions, but not the statutorily appointed Consumer Advisory Board members,” said National Consumer Law Center attorney Chi Chi Wu, who is also a member of the Consumer Advisory Board. But John Czwartacki, chief communications officer and spokesman for the bureau, noted CFPB has not fired anyone and will "continue to meet its statutory obligation to convene the Consumer Advisory Board meetings as well as enhanced forms of public outreach and engagement as referenced in the announcement this morning." Czwartacki added: "The outspoken members of the Consumer Advisory Board seem more concerned about protecting their taxpayer funded junkets to Washington, D.C., and being wined and dined by the Bureau than protecting consumers." This story has been updated with comment from CFPB spokesman John Czwartacki.